Cirque du Minimaliste is a new independent deep-minimal label located in Hamburg. It has been established in 2010 by Felix Saar (aka Felix Lorusso) and Tanja Rückwardt (aka Ira & I) to release deep and dark minimal music without any compromise. The focus lies on the creation of a platform, aiming for more diversity on the dancefloor as well as in the record collection. We welcome you to the dark corner oft the marquee. The 8th release of Cirque du Minimaliste is filled with finest dark matter music,progressive, straight forward and grim. 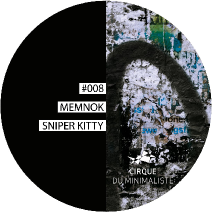 Memnok will drive you insane with "Kitty Sniper"and "Shadowbox", those tracks inherit the soul of the machine they were produced on.To top it of Maksim Dark and Scalameriya provide mindbending remixes to this release,making it a "musthave" for all dark-minimal enthusiasts. Besides the two originaltracks and the remixes CdM adds a DJ-Tool allowing you to personalize your mixand let the crowd go through the roof.